The finish line, a most welcome sight! We rock up at training on 2 January 2010 only to discover Bondi beach has been replaced by Lake Bondi. Nary a wave to be seen. Why on earth could it have not been like this on the first week? We do a point to point (Boat Ramp to Icebergs) and shock! I enjoy it! Without the waves I can just relax and settle into a routine. Next Saturday is much the same, calm and relaxed. 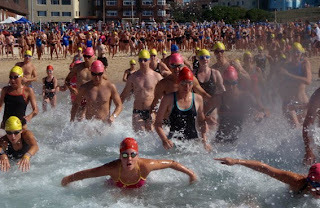 Given almost everyone is doing the Bondi Roughwater swim the next day we work on the course. Decide rip is the best option. Am now voluntarily swimming in rips. Who would have seen that coming? Race day is brilliantly organised. Instead of the 45 minute reg queue it takes 5 minutes. We cheer the 1km swimmers home and then go warm up. Sou-Easter has hit bringing swell with it. Joy. Hard slog out to the first buoy. Am overtaken by Mel (a friend who wins gold medals in the World Masters!) very happy to be overtaken by someone I know. Bit easier from then on. Get into a rhythm. Despite having been told it wouldn't be necessary to go through the gate (two buoys lined up) I almost run into a surf ski that tells me it is necessary. Keep on stroking. People keep swimming into, over, under and around you. Disorganised chaos. Sprint up the beach, stoked to have reached another girl in my age category. Only to realise she'd already done the 1km event. Last out of the water is a Can Too mentor. She's done the program before in response to a death in her family. This is her first time ever swimming 2km. She sprints over the finish line in tears. Suddenly my fears seem pretty stupid!